In attempting at the weekend again to reclaim the mantle of republicanism for Fianna Fáil, most notably from Sinn Féin, party leader Micheál Martin was returning to well-ploughed furrows. 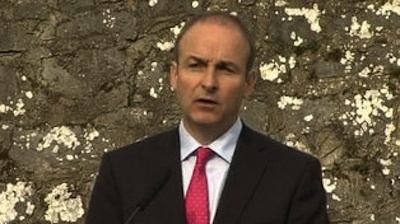 Speaking at the party’s Wolfe Tone Commemoration in Bodenstown on Sunday, Mr Martin rehearsed familiar arguments about the “great tradition of Irish republicanism” defined in terms of religious equality, freedom and constitutionalism, the “objective of creating a state which is tolerant, outward looking and run in the interests of the people.” Above all, a willingness to embrace change. In truth it would be more useful if in the process of shaking off its recent past, rebranding and reviving Fianna Fáil, whether as the republican party or the party of a new form of republicanism, that Mr Martin would go beyond old platitudes and put new flesh on the concept for new times. And not just as a codeword for support for national unification, but as a theory of government underpinning the shape of the Southern State. What has this venerable political theory to say about the systemic crisis in our democracy? Specifically about how popular sovereignty should be expressed? About the primacy of the citizen over special interests? About voting systems, parliamentary accountability, the relationship between executive and legislature. . .? For sure, we don’t believe in monarchy, but what distinguishes a republic from any old liberal democracy? But if he added little to our understanding of the substance of republicanism, Mr Martin did sound useful warnings about what many, not least in the North, see as the Government’s loss of interest in its affairs. He attributes a political lethargy to the “extremely short sighted . . . idea that seems to have seeped into Government Buildings – that ‘the North is sorted’ ”. He attacks the Taoiseach for failing to initiate new policies, or even to have meetings on the issue, and “a complete backing away from the ambitious agenda” of extending the work of cross-Border institutions into new areas. “The peace process,” he argues, “was always intended to be about more than an absence of violence. The people of the North deserve a political system that delivers progress that demonstrates that politics works and which is about making their lives better.” The lack of interest of both governments is compounded by the failure of the Assembly and the Executive to make a real difference to people’s lives, he says. There is more than a little truth to what he has to say.